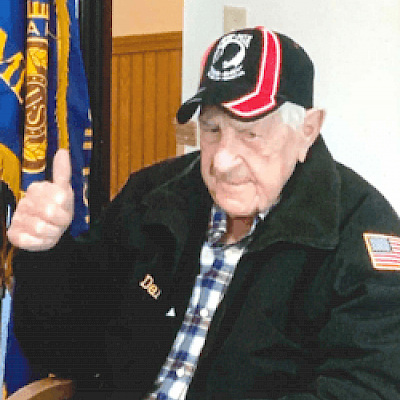 Darwin Wesley Wosepka, 100, of Haugen died Thursday, March 14, 2019 at Heritage Lakeside. He was born January 6, 1919 in Vienna, SD to Emil and Jenny (Bruha) Wosepka. Darwin was in the National Guard from 1935-1938 and was drafted in 1943.Darwin was in the Signal Corp stationed in Iceland where he spent most of his time. He was married in Rice Lake on April 26, 1941 to Elaine Scheurer who preceded him in death on July 6, 2004. After his time of service, he came back to Rice Lake and began working for REA, and later NSP where he retired after 35 years. Darwin had a passion for cooking and baking. He is famous for his pork roast and dumplings, hash, his many stews, and baking famous kolaches. Some of his favorite pass times were going to the casino, trying new restaurants, shining deer, spending time with family, and going to coffee with his friends. He also had a great love for animals, and had a special love for his cat Snoopy. He is survived by: his children: Robin Wosepka of Rice Lake, and Wendy Wosepka of Rice Lake; 5 grandchildren: Nicky, Travis, Jackie, Janelle, and Justin; 8 great-grandchildren; 2 great-great-grandchildren; nieces; nephews; many other family and friends; including a dear friend, Ardyce Kodesh. Darwin was preceded by his wife, Elaine; his daughter, Jenny; grandson, Joel; and sister, Irene. Funeral services will be held at 12 PM Wednesday, March 20, 2019 at Skinner Funeral Home in Rice Lake with Robert Heinze officiating. Visitation will be held one hour prior to the service. Burial will be in Northern Wisconsin Veteran Memorial Cemetery followed by a light lunch at Cousin's Hide-A-Way. Skinner Funeral Home of Cumberland/ Turtle Lake is serving the family.